“Of living writers I have some hesitation in speaking, but on any list that I was forced to compile the names of E. F. Benson, Blackwood, Burrage, De la Mare and Wakefield would find a place.” – M. R. James in his 1931 essay Ghosts, Treat them Gently. The day had been one unceasing fall of snow from sunrise until the gradual withdrawal of the vague white light outside indicated that the sun had set again. But as usual at this hospitable and delightful house of Everard Chandler where I often spent Christmas, and was spending it now, there had been no lack of entertainment, and the hours had passed with a rapidity that had surprised us. A short billiard tournament had filled up the time between breakfast and lunch, with Badminton and the morning papers for those who were temporarily not engaged, while afterwards, the interval till tea-time had been occupied by the majority of the party in a huge game of hide-and-seek all over the house, barring the billiard-room, which was sanctuary for any who desired peace. But few had done that; the enchantment of Christmas, I must suppose, had, like some spell, made children of us again, and it was with palsied terror and trembling misgivings that we had tip-toed up and down the dim passages, from any corner of which some wild screaming form might dart out on us. Then, wearied with exercise and emotion, we had assembled again for tea in the hall, a room of shadows and panels on which the light from the wide open fireplace, where there burned a divine mixture of peat and logs, flickered and grew bright again on the walls. 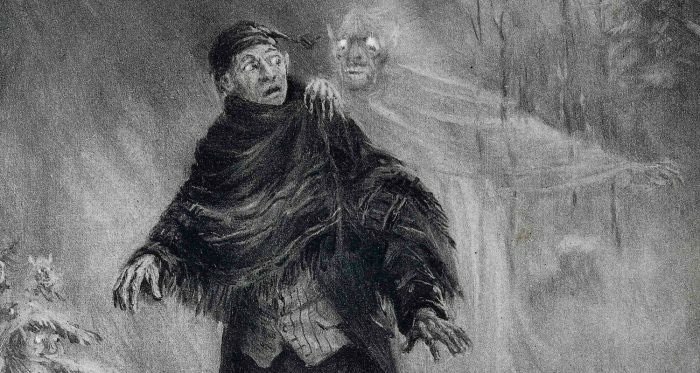 Then, as was proper, ghost-stories, for the narration of which the electric light was put out, so that the listeners might conjecture anything they pleased to be lurking in the corners, succeeded, and we vied with each other in blood, bones, skeletons, armour and shrieks. I had, just given my contribution, and was reflecting with some complacency that probably the worst was now known, when Everard, who had not yet administered to the horror of his guests, spoke.